Gabe Newell: "We are not announcing anything at E3"
Discussion in 'News' started by Chris D, Apr 23, 2012. 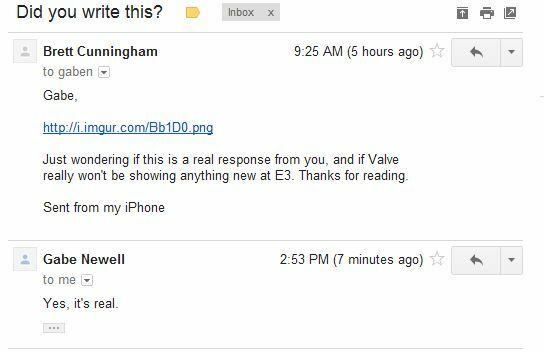 Forum member tabernumse has posted an e-mail response he has received from Gabe Newell with regards to plans at E3. For those unsure on the legitimacy of this correspondence with Gabe, we have personally been forwarded the email, video evidence and further confirmation from Gabe. Wow. Keep up the good work, Gabe! of course. They are launching CS: GO and DOTA 2 still using the old Source this year. Any HL3 announcement with Source 2 would overshadow the other games, and it would be a commercial suicide. 2013, with next gen consoles and new source engine will be the year. E3 is near, we're almost in May. It's legit, although they can be faked the guy this came from did post the e-mail headers. They match up to an e-mail I received from Valve recently. CS:GO is certainly targeted for Summer 2012, with E3 being in July that still works. As for Dota 2 I believe it's just "2012" at the moment. I thought I had mastered the Valvetime Numerology. Interesting that they would put the ... prefix at the end of the sentence. Portal Map Creator? Both the sender and recipient mentioned Half-Life3, not Episode 3. Do you think Gabe pulled a sly one to keep a secret? Afterall we know they have been working on Episode 3 since Episode 1, just they have never shown their work. He clearly stated: "No new announcements". Besides, he has previously said that they have moved on from the episodic model. All well, I am at the 'acceptance' stage and now interested in Joel Nielsons webpage. It is comforting to know that as soon as he starts taking paypal orders, you can expect Black Mesa to be released 2 weeks after. It's expected, Valve never dilute the attention they're giving to their next titles by overshadowing with a new game. Still, that doesn't stop the obligatory photoshopped Gordon / Lambda with a 3 appearing! Oh boy what a surprise. Even though your avatar is horrible, it matches pretty well with your post. Here is a video directly from my browser of me interacting with the email in various ways.. This way, at least you will know it's not photoshopped.. There really isn't much else I can do to prove that my information is legit. Give me your gmail password. That is a bad password. Should throw some numbers in there and make it at least 8 characters long minimum. It's okay tabernumse, you don't have to prove anything. Much of the community remains mired in the denial stage and I don't blame them because stage two is a terrible place, where we become angry and lash out at Half-Life! Then comes bargaining with it's online petitions and campaigns attempting to make a deal with the cruel mistress of fate that took our crowbars away. Stage four was toughest for me, when my brother found me crying before a seven foot tall mash potato effigy of the citadel. But acceptance comes and we all let go. No one goes to that much trouble. Just. Let. Go. People. Gabe says there'll be no new announcements at E3. End of. You realize not one of the replies in this thread actually think it's fake, right? At least, not any after you first added your reply confirming that it was legit. Everyone started making jokes after that. Maybe in this thread, but I've had our own staff editing my news post saying it's "Pending Confirmation" and posts elsewhere saying it's fake. It isn't. It's just denial. It's a no go for E3 this year. Maybe in this thread, but I've had our own staff editing my news post saying it's "Pending Confirmation"
Its odd that they plan on showing two games which have been exposed heavily already, and is in beta. I guess it sorta makes sense for the Big Picture Mode to appear at E3, though. How is that odd? They want to generate hype coming up to release. How can you generate hype thats already in public beta? What is there to show? Gabe last year mentioned E3 wasn't the right venue for Dota 2, and CSGO will most likely be a Steamworks/PSN/Xbox live marketplace game. Doesn't make sense. There are many different groups of gamers in the world, and a heck of a lot of people who won't be aware of the CSGO or DOTA2 betas. E3 has become a focal point for game news that can reach a very broad selection of people, especially in parts of the industry that valve has limited reach into by comparison (Consoles for example). There is a lot of Industry Business that gets handled at these conventions beyond simply announcing new titles. On the other hand, its possible that the main focus will be 'Big Picture' mode and CSGO and DOTA2 will simply be used to demonstrate its functionality, their reserved room is pretty small afterall. There was now little value in doing the same thing even twice; almost all the value was in performing a valuable creative act for the first time. Then, the only things from Valve this year are Dota 2 and CS:GO. Disappointing. Next cycle should bring some exciting times though, if recent leaked videos are truly prescient. That's true, but Dota 2 and CSGO already have large fanbases. Also Doug Lombardi said that Valve only goes to E3 to announce new titles, so that only confuses me even more. A new Half-Life wouldn't interfere at all with Dota 2 and CSGO, they are completely different games. Ones a single player centric game, the others are a multiplayer experience. Like I said, they have their own fanbases, the Counter Strike community is the Counter Strike Community, the Dota 2 community is the Dota 2 community and the Half-Life community is the Half-Life community. Each would market to a different kind of crowd. And they might package them all into some sort of colored box or something crazy like that.